Qualifier 2: David Warner And Bipul Sharma Pull Off A Thrilling Victory Against Gujarat Lions..!! The weekend and the determination of the second finalist of the ninth edition of the Indian Premier League (IPL) drew in thousands to the Feroz Shah Kotla on Friday. With orange flags being hurled in equal proportions, it was Sunrisers Hyderabad’s Orange Army, led by a magnificent innings from captain David Warner, that pipped Gujarat Lions in a thriller to book their maiden spot in the final where they will contest for the silverware against Royal Challengers Bangalore. After a rather poor start that once again saw Gujarat’s top order fail – as they have in the latter half of the tournament – they did well to recover with 95 runs in the second half to reach 162 for 7. Taking into account that the next-best score to David Warner’s 93 off 58 balls, was a brilliant 11-ball 27 from Bipul Sharma at No. 8, it was reflection of the magnitude of the skipper’s innings and his fortitude to hold his bat throughout. Warner finished unbeaten as he ended Gujarat’s maiden season with a four-wicket win. The blip in Sunrisers’ approach to their chase was indeterminacy of whether to accelerate in the powerplay or set the base. In the end, they ended up doing neither. Shikhar Dhawan was caught short of his crease in the second over after Brendon McCullum fired in a throw at the stumps from cover point. Yuvraj Singh and Moises Henriques couldn’t replicate their outings from the other night, a result of which, Warner had to once again don his steadfast cap and keep his side in the chase. Wickets tumbled at the other end as Warner struggled to forge substantial stands while doing the dirty work himself. Surpassing the 700-run mark this season, he cruised to another half-century off 35 balls, to become the batsman with the most fifty-plus scores in the IPL. Gujarat couldn’t curb Warner’s trademark offside play as he creamed the cover regions. Shivil Kaushik, coming in for Shadab Jakati, made his presence felt as Sunrisers slipped to 84 for 5. Kaushik troubled Yuvraj Singh, who seemed scratchy in his 13-ball stay. With the chinaman bowler varying his pace and lengths, coupled with the slowing down of the pitch under lights, Yuvraj holed out in an attempt to break free. Cutting was unlucky to be adjudged caught-behind off Kaushik after the bat hit the front pad, but was mistaken for an edge. With Sunrisers still 66 short with 36 balls remaining, Warner took on Dwayne Smith and squeezed 19 runs with the pressure building. It was a no-brainer that Sunrisers needed Warner until the end; was also little surprise that Gujarat tried to get under his skin. After a brilliant 16th over from Dwayne Bravo that yielded just two runs, Praveen Kumar walked towards Warner with the two indulging in an exchange that needed Dinesh Karthik to intervene to stop an advancing bowler. Two overs and 24 runs, Warner hit Bravo for a boundary and Bipul ended the over with a six as 19 were scored that over. Warner wrapped up proceedings quickly in last over that needed five, hitting a boundary off Praveen and pumping his fists in joy. He ended the innings with a single to break into a trademark Warner celebration with a jump and the air-punch of his helmet. 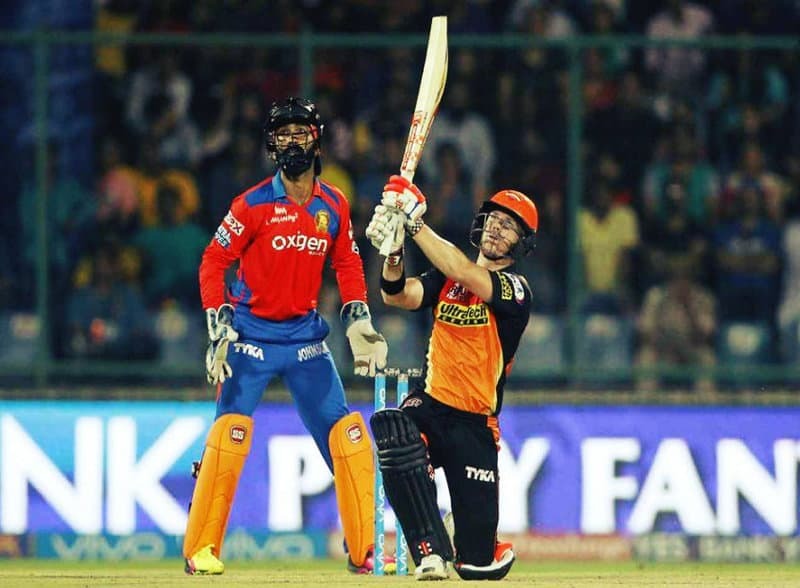 If Sunrisers’ fielding effort against Kolkata Knight Riders pleased Warner, the one against Gujarat would’ve left him delighted – albeit only until a point after opting to bowl. The first half of Gujarat’s innings saw spectacular ground fielding where Sunrisers held onto catches, didn’t concede easy singles and a direct hit from Trent Boult dismissed Dinesh Karthik just when it looked like he was upping the run rate. That effort helped Sunrisers curb Gujarat’s implosive batting line-up as they had only 67 on the board for the loss of three wickets. In perhaps a ploy to protect Aaron Finch and Smith against the new ball, Gujarat promoted Eklavya Dwivedi to open with Brendon McCullum. The move didn’t pay dividends as Bhuvneshwar had the batsman caught after slogging a short and wide ball. McCullum timed the ball beautifully, but Sunrisers’ fielders kept the batsmen in check with 19 runs in the opening three overs with as many as 10 dots. McCullum’s wrists came into use early as the bowlers got the ball to lean into his pads as opposed to finishing on the off stump. As the ball angled in, he got into position early to score most of his runs in the fine leg region. Aaron Finch was handed a life on 13 by Barinder Sran in the 12th over, who dropped a sitter at short fine leg, which Sunrisers paid the price for. McCullum departed in the same over for 32 off 29, but Finch went on to score a half-century which helped Gujarat finish on a high after a poor start. Gujarat were 83 for 5 after Dwayne Smith fell cheaply, but Finch and Ravindra Jadeja got together to put on 51 runs – a partnership that provided definition to their innings. Finch was flirting with danger, but his self-assurance was worthy of praise, given that Gujarat needed some lifting. Ben Cutting’s piece of brilliance at the boundary should’ve been enough to lift Sunrisers after Henriques was hammered for 17 runs by Finch. The burly Australian mistimed one off Sran which sailed to the deep midwicket fence, but found Cutting, who leapt into the air, clasped the ball, realised he was tipping over and chucked the ball in while in the air. That superman effort, however, didn’t alter proceedings as Finch’s sentience and power outdid Sunrisers bowlers in the final five overs as Gujarat took 53. Mustafizur Rahman’s last-minute hamstring strain made way for Boult to play his first match in three months. Having last played a practice match against England at Mumbai BKC on March 12, Boult’s rustiness couldn’t have been understated. The challenge in replacing Mustafizur wasn’t so much how he started, but how he would fare at the death. Conceding 13 runs in his two overs upfront, and the wicket of Raina after trapping him leg before in his second over, Boult was taken to the cleaners in the death. First by Finch, and then taken apart by Dwayne Bravo, Boult leaked 26 runs as the momentum switched between the sides. What didn’t help Sunrisers in those final overs was also some shoddy fielding where they gave away one too many runs, but Warner’s brilliant effort with the bat helped mask those blunders.